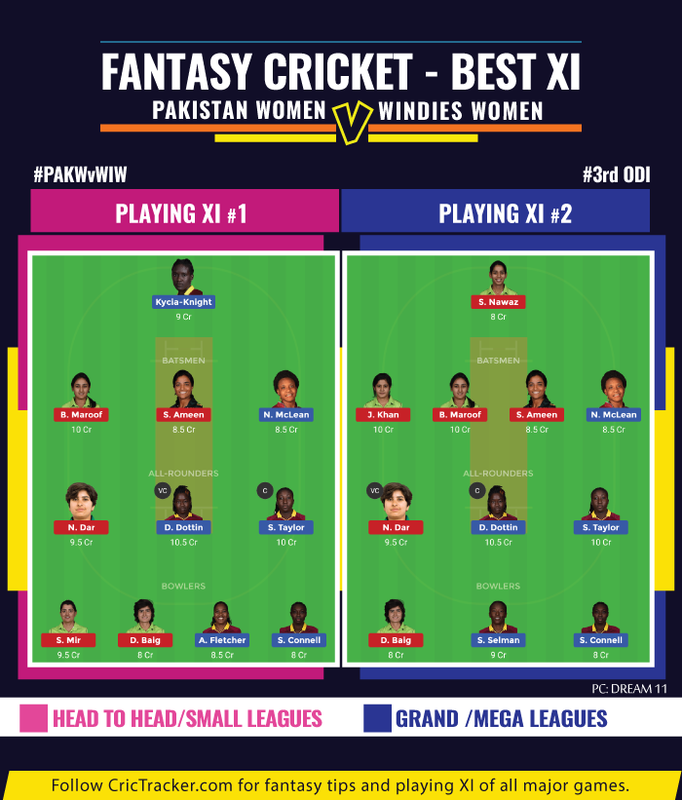 Find out the expected top performers for the final ODI between Pakistan Women and Windies Women. After suffering a 146-run defeat in the first ODI, Pakistan Women made a brilliant comeback in the 2nd ODI to level the 3-match series against the Windies Women. In the 2nd ODI, the Pakistan Women put on a much better batting effort thanks to Sidra Ameen’s 96 and Nida Dar’s 81. The duo accounted for 177 runs while the remaining players collectively scored 63 in Pakistan’s total of 240/10. Diana Baig, playing her first game of the series, broke through the top order while Sana Mir chipped in with wickets at crucial moments. Natasha McLean’s lone fight with a 76-ball 82 and Stafanie Taylor’s 48 were only decent contributions for the visitors in the chase. The series decider could be a cracker of a match with all the key Pakistan players recovering from fitness woes. The third and final game of the 3-match ODI series between Pakistan Women and Windies Women will be hosted by the Dubai International Cricket Stadium. The match starts at 9:00 AM local time (5:00 AM GMT) (10:30 AM IST). The streaming of this match is available on Pakistan Cricket Board’s YouTube Channel. Pakistan Women: W, L, L, L, L.
Windies Women: L, W, W, L, L.
The pitch was on the slower side during the first two matches as the day progressed. With scores of 216 and 240 in the two games for the teams batting first, once again the first batting side could end up posting 210+ and bag the series. Sidra Ameen, Nahida Khan, Javeria Khan, Bismah Maroof (C), Nida Dar, Sana Mir, Sidra Nawaz (WK), Diana Baig, Kainat Imtiaz, Aliya Riaz, Nashra Sandhu. Bench – Omaima Sohail, Aiman Anwer, Saba Nazir. Omaima Sohail might get another chance depending on the fitness of the top order. Kycia Knight (WK), Deandra Dottin, Stafanie Taylor (C), Shemaine Campbelle, Natasha McLean, Chedean Nation, Chinelle Henry, Afy Fletcher, Anisa Mohammed, Shamilia Connell, Shakera Selman. Bench – Karishma Ramharack, Merissa Aguilleira, Rashada Williams. Bismah Maroof recovered from a hit on face making her miss the first ODI but recovered for the 2nd. 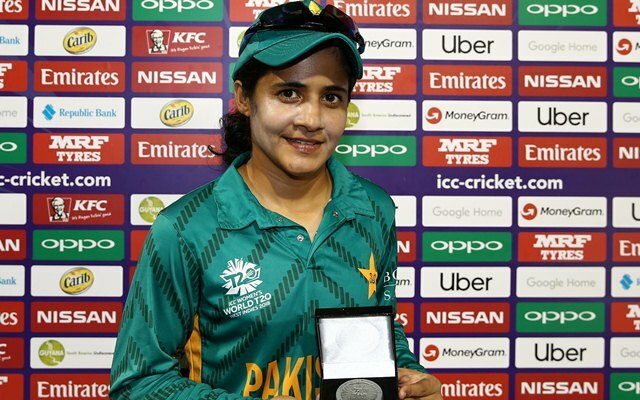 Javeria Khan suffered cramps in the first ODI but featured in the second game. Nahida Khan featured in the 2nd ODI even after been stretched off during the first due to a hit on the helmet. Aiman Anwer didn’t play the 2nd ODI due to a hamstring injury since suffered in the first match. Anisa Mohammed has a brilliant record in the ODI format against Pakistan. The off-spinner has 36 wickets from 16 games at an average of 9.08 with four 5-wicket hauls against them. However, she failed to pick up a wicket in the last four games in this tour. Anisa didn’t bowl in the first ODI while she went wicketless in the 2nd game. She will be crucial for Windies’ chances in the series decider. Stafanie Taylor and Deandra Dottin will obviously be the main choices as captain and vice-captain. Other than these two, the likes of Nida Dar, Afy Fletcher and Sana Mir can be considered for the multiplier roles. Given the performances in the first two games, picking both Bismah Maroof and Javeria Khan will be risky. Both the senior batters of Pakistan team are valued at 10 credits. Windies Women are expected to make a comeback and seal the ODI series against the Pakistan team. *Disclaimer: This team is based on the understanding, analysis and instinct of the author. While selecting your team, consider the points mentioned and make your own decision. Get the latest Cricket News and updates, Match Predictions, Fantasy Cricket Tips and lots more on CricTracker.com.